With Liverpool's match at Birmingham never likely to get the creative juices flowing, I began to think about where it all began this weekend. Why is Liverpool FC so important to me? Why does a day never go by where I don't talk about the club (often to people who couldn't care less)? Why do I risk being late for work to check the teletext for transfer gossip? Why, when I know I'm being ripped off, do I pay hundreds of pounds to travel abroad to watch a match? The truth is - I don't know. For many it's a family thing. Like it or not, they were dragged to Anfield at an early age and they caught the bug. Or maybe, they sat down on the couch, watched a game on the telly and fancied the real thing. And after mithering and mithering, their weary dads caved in and took them to a game. And they caught the bug. My dad's not into footie. He might watch a game, often a majorly important European match. But the reason will be 'there wasn't anything else on'. If I had a quid for every time he's said 'you're spending all that money to watch a bunch of fellas kick a ball? ', I could retire. And I'm only 31. So, it's not a family thing. And yet I can always remember being obsessed. I remember as a kid getting butterflies in my stomach. Not because I was at the match. No such luck. I just happened to be near Anfield with the match on the car radio. I was going somewhere much more boring. The Wirral. But the fact I could see the floodlights gave me a buzz - I had the bug. I remember watching many a game on a black and white portable television in the back room. There was no way my mum and dad would watch it on the 'big telly' -despite my requests, attempts at blackmail and tantrums. I even watched the 1984 European Cup Final in the back room. And the '85 one too. On a 14-inch screen. Now's that's dedication. I got it for Christmas and it came in a box (the kit, not my girlfriend). It's still got to rank as one of the greatest presents ever. 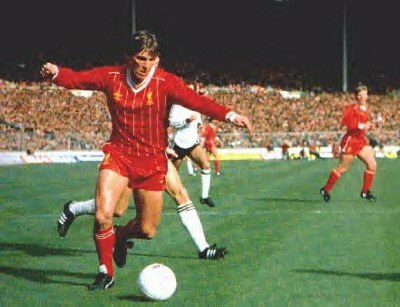 As far as I was concerned, I was Kenny Dalglish. And it was only right that I went into my mum and dad's room at 7am on Christmas Day and told them so. Still though, no match. To me, the world was against me. There was many a sulk. But there was no argument. My dad wasn't taking me - and I wasn't allowed to go on my own. How I lasted until aged 14, I don't know. But on September 25, 1990, I climbed the steps to the Kop for the first time. Not that my dad knew about it. But by then, I had taken matters into my own hands. I can still remember the game. Just seeing the pitch was amazing. The pitch was perfect. And to me, then, there was an electric atmosphere. On reflection, perhaps there wasn't. That night Liverpool didn't line up against Everton. It wasn't Manchester United, Barcelona, Inter Milan or even Spartak Moscow. Nope, that night we played Crewe in the League Cup in front of a crowd of less than 18,000. But I loved every minute of it. 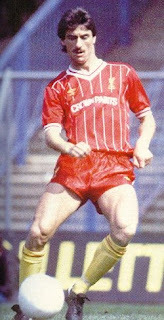 It finished 5-1 - Steve McMahon, Gary Gillespie, Ray Houghton and two for Ian Rush. I can even remember the name of the Crewe goalkeeper that night. Dean Greygoose. Random, but fact. And that was that - I was hooked. The parents were informed. Like it or not, I was going the match. And just like George Gillett and Tom Hicks, They didn't get it. They still don't. And they probably never will. And 18 years on, I'm left wondering, why? Where did it all come from? And I just don't know. The butterflies thing strikes a cord so much. I used to hide under the bed with the radio so if we got beat no one would see me cry.